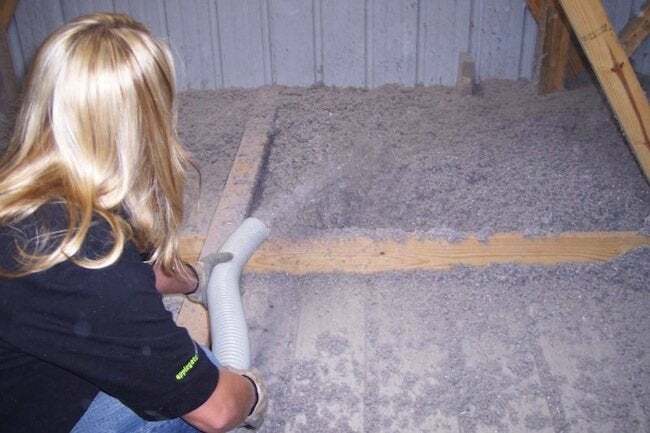 For cost-effective insulation that can be brought into older homes, consider blown-in cellulose, the installation of which can be successfully handled by experienced do-it-yourselfers. There are several different kinds of insulation—fiberglass batting, rigid boards, and spray-on foam to name a few. For retrofitting an older home, though, the most cost-effective insulation material is blown-in cellulose. Cellulose fiber is made up mostly of recycled newspaper that has been treated with non-toxic borates to make it fire retardant and resistant to mold and insects. Cellulose is light and fluffy to the touch, but it can be packed densely into wall cavities to form a thick blanket between a home’s interior and the world outside. It has the added advantage of being able to settle into small gaps and cracks, where it can help eliminate drafts as well. Homeowners can rent a blowing machine and pump cellulose into an open area, such as an attic floor, but it’s a messy job that’s not for those who are new to DIY projects. Blowing cellulose into exterior walls is definitely a job for the pros, who know how to achieve proper density, how to identify and work around any fire blocks within walls, and how to close up the walls properly afterward. Most importantly, if you’re insulating around a soffit vent, a pro will know how to keep that vent clear so that air keeps moving and your roof doesn’t get damaged.